You have begun planning your Walt Disney World vacation. Dining can be done 180 days in advance and your family begins picking their top choices. One of your children says, “Where is Beaches & Cream Soda Shop?” You think to yourself, I have no idea. Is it a restaurant? When you began planning this Disney vacation you never came across Beaches & Cream Soda Shop. Beaches & Cream Soda Shop is a hidden restaurant gem in Walt Disney World. It is located in Disney’s Beach Club Resort and is a 50s style diner. Their menu includes: chili, burgers, Reuben sandwiches, vegetable burgers, cheddar bacon ranch chicken sandwiches, turkey club, meatloaf sandwiches, grilled cheese, and tuna, chicken, or egg salad sandwiches. You get the choice of fries or onion rings with your sandwich. The highlight of the meal is upon you when it is time for dessert! 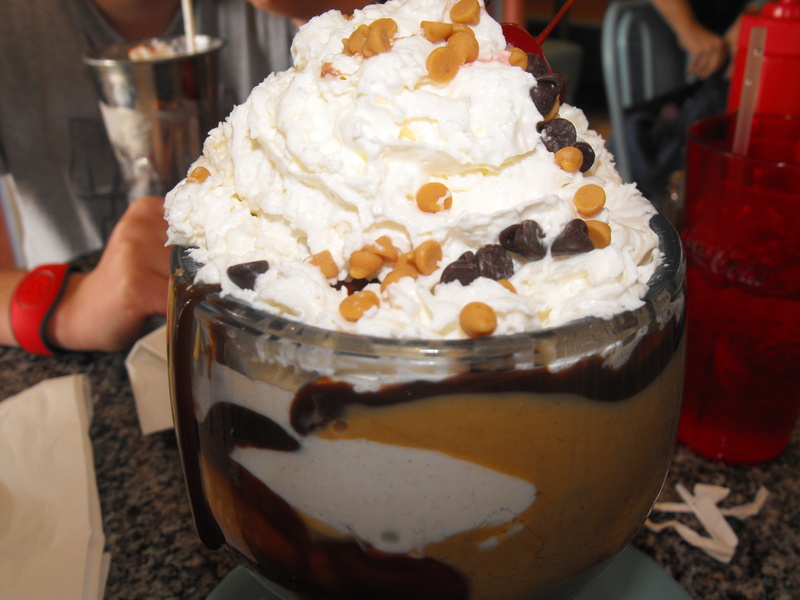 Beaches & Cream has mouthwatering sundaes that will knock your Mickey Ears off! They have names like Fudge Mudslide, Snickers Sundae, Classic Banana Split, and the No Way Jose! The No Way Jose is one of my favorite sundaes. It contains chocolate and vanilla ice cream, peanut butter, hot fudge, peanut butter and chocolate morsels, and whipped cream. You can even order a classic sundae, brownie a la mode, a milkshake, or even just an ice cream cone. A sundae you may have the courage to tackle is the “Kitchen Sink!” It includes 8 scoops of ice cream, all the toppings in the house, and a whole can of whipped cream! If you don’t have the time to sit down, Beaches & Cream has a To Go counter as well. You can order any ice cream cone, sundae, or milkshake. There is a restriction with the “Kitchen Sink.” You cannot order the full one, but they have an individual one for takeout. When you are ready to begin the planning of your next Disney vacation in Walt Disney World make sure you put Beaches & Cream Soda Shop on your wish list!